Impetigo, erysipelas, cellulitis and necrotising fasciitis represent a spectrum of soft tissue infections. Most are of mild to modest severity, but a few are life-threatening. This module aims to explain important clinical differences in presentation and to enable the clinician to differentiate those patients with life-threatening features from those who can be safely managed in the community. Impetigo is a superficial infection of the epidermis. It is caused by Staphylococcus aureus and group A beta-haemolytic streptococci (GABHS, also called Streptococcus pyogenes). Treatment needs to cover both organisms as they often co-exist. 30% of population carry Staphylococcus aureus in the anterior nares and may get recurrent impetigo around the face. Children may carry it around the perineum where it can cause a desquamating infection. Up to 90% of patients with atopic eczema are chronically infected with Staphylococcus aureus which may be responsible for eczema flares. Burns may be secondarily infected by Staphylococcus aureus, delaying healing. Methicillin-resistant Staphylococcus aureus (MRSA), either hospital or community acquired, is now a frequent cause of impetigo, especially with folliculitis or abscesses. 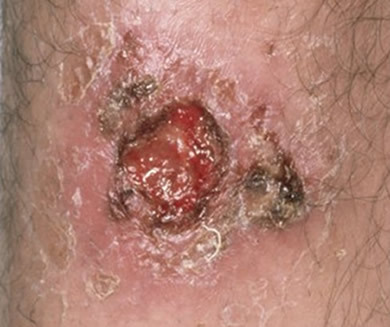 Several clinical forms of impetigo exist. All forms are more common in children, with the bullous form seen mainly in the under twos and the non-bullous two to five year-olds. Adult contacts may develop crusting impetigo or folliculitis around shaved areas on the face and axillae. 1. Non-bullous impetigo is the usual form. Red macules form initially, then golden crusts. It is itchy but not painful. Regional lymphadenopathy is common. Fig 1: Non-bullous impetigo. Reproduced with permission from Wellcome Images. 2. Bullous impetigo. Here there is sloughing of the epidermis due to toxin production. Vesicles/bullae may be on face, buttocks, nappy area or trunk. Fig 2: Bullous impetigo. Reproduced with permission from Wellcome Images. 3. Folliculitis is infection of the hair follicles due to Staphylococcus aureus. 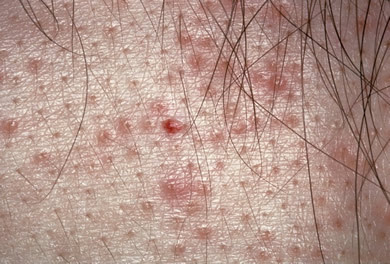 Fig 3: Folliculitis. Reproduced with permission from Wellcome Images. 4. Ecthyma, which is deeper, ulcerating & associated with lympadenitis. Fig 4: Ecthyma. Reproduced with permission from Wellcome Images. 5. Secondary infection of pre-existing skin disease or traumatized skin, also called impetiginous dermatitis. 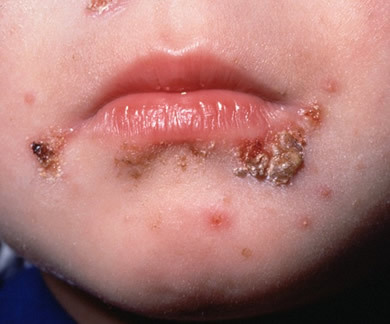 Fig 5: Impetigenised dermatitis. Reproduced with permission from Wellcome Images. Systemic upset is rarely seen. Complications are rare and seen mainly in neonates or imunosuppressed patients. They include meningitis, sepsis, secondary cellulitis, pneumonia and septic arthritis. Post-streptococcal glomerulonephritis is occasionally seen in young children. Neonates have a much higher incidence of developing sepsis and meningitis so require paediatric referral. Cellulitis is an acute, spreading bacterial infection of thedermis and subcutaneous tissue, usually complicating a wound,ulcer, or dermatitis. Affected skin becomes tender,warm, erythematous, and swollen. Any age group may be affected & numerous organisms can cause it. Erysipelas is a superficial cellulitis with invasion of the lymphatics. It is generally caused by Streptococci, especially Streptococcus pyogenes. Lesions are classically well-demarcated, fiery red and raised. Apeau dorange appearance (dimpling) is due to tethering of hair follicles within the oedematous dermis. Infants and the elderly are more commonly affected. 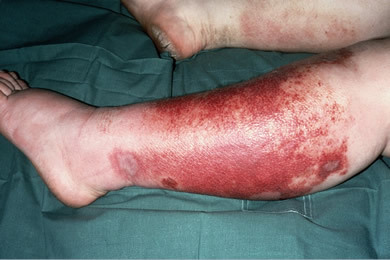 Fig 6: Cellulitis. Reproduced with permission from Wellcome Images. 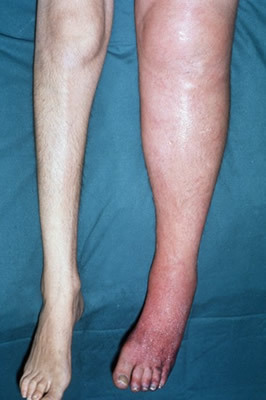 Fig 7: Erysipelas. Reproduced with permission from Wellcome Images. Red, oedematous tender spreading areas, which are well demarcated in erysipelas but diffuse in cellulitis. There may be small haemorrhagic areas. Sometimes lymphangitis and regional lymphadenopathy. 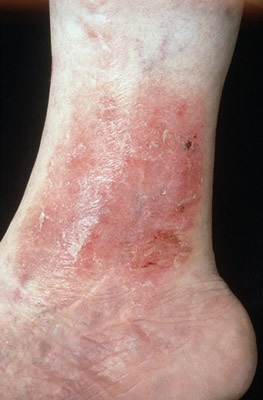 Entry wound, bite, septic source or pre-existing skin pathology such as venous eczema or athletes foot is often apparent. Usually mild. Fever, tachycardia, confusion, hypotension, and leukocytosis are sometimes present and may precede visible skin changes. Commonest site is the leg usually unilateral, but bilateral cellulitis does occur rarely. Arm and breast cellulitis occurs after mastectomy. Other types of eczema, (eg atopic or contact). Fig 8: Panniculitis. Reproduced with permission from Wellcome Images. 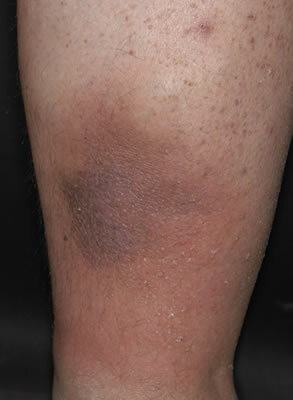 Thrombophlebitis results in chronic skin discoloration and scarring, sometimes with oedema. However there is no erythema and generally no discomfort unless there is associated eczema. Fig 9: Post-phlebitic limb. Reproduced with permission from Wellcome Images. 3. Leg eczema. Various forms can affect the leg. Discoid eczema can arise at any age and results in round or oval plaques. Dry discoid eczema is often relatively non-itchy, and is often due to over-dry skin. 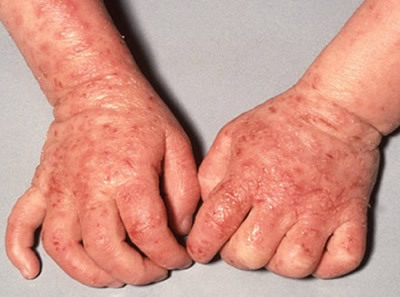 Exudative or wet discoid eczema is often triggered by an injury to the skin (insect bite, burn or cut), and colonised or infected by Staphylococcus aureus. Discoid eczema starts with a single patch on one leg, but soon multiple lesions appear on both lower legs and may later affect the trunk and arms. Atopic eczema is seen mainly in children. In older children and adults it is commonly found behind the knees, but can affect large areas during flares or if secondarily infected. Characteristically, atopic dermatitis is very itchy. 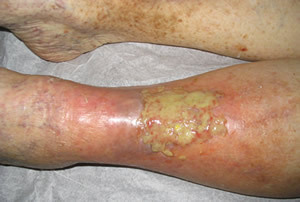 Fig 10: Leg eczema. Reproduced with permission from Wellcome Images. (also called venous eczema, stasis eczema or gravitational eczema) develops secondary to poor venous drainage in the leg. Episodes of cellulitis or deep vein thrombosis damage the valves, back pressure develops and fluid collects in the tissues, resulting in chronic skin inflammation. The affected leg is usually swollen, due to both inflammation and lymphoedema. Dermatitis is usually bilateral, with yellow crusting, scaling, and marked itching. It may become secondarily infected, in which case discomfort and erythema would increase, helping to differentiate acute cellulitis from the chronic appearance. 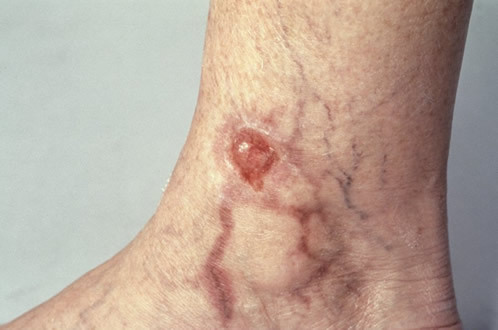 This is an inflammation of the superficial leg veins, resulting in a tender red or purple subcutaneous cord and associated swelling along the track on the vein. It may be secondary to deep vein insufficiency, cannulation or injection (eg in iv drug abusers) or malignancy (causing migratory thrombophlebitis known as Trousseau Syndrome). 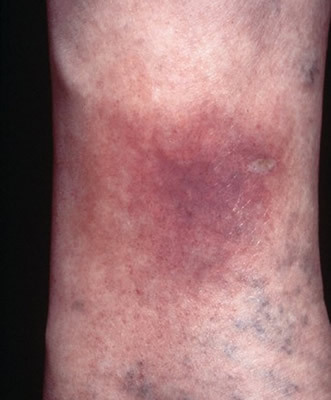 Fig 12: Thrombophlebitis. Reproduced with permission from Wellcome Images. This does not usually cause significant erythema or blistering, though there may be associated superficial thrombophebitis. Similarly it is not generally tender, though there may be tenderness along the deep veins. Pitting oedema may be present, and swelling may be marked compared to the unaffected side (more than three cm). Fig 13: Deep vein thrombosis. Reproduced with permission from Wellcome Images. Patients with Class I cellulitis can be managed in the community with oral antibiotics (1,3). Facial and orbital cellulitis. These require urgent assessment by the appropriate specialities because of the high risk of local complications. Swab any broken skin. Culture blister fluid. Necrotising fasciitis is a rapidly spreading infection of the subcutaneous tissues, with characteristic widespread fascial destruction. There may also be necrosis of the underlying muscle, depending on the organisms involved. It may be caused by single bacterial species (Clostridium perfringens or Group A Streptococci, Bacteroides and Staphylococcus aureus), or be polymicrobial. Anaerobic organisms are often present in addition to aerobes and can form gas (gas gangrene). A saltwater variant also exists, in which a minor skin wound becomes infected with a vibrio species. All varieties are rapidly progressive, resulting in massive tissue loss, multiorgan failure and death if not rapidly treated with surgical debridement. Initially diagnosis may be very difficult with presentations similar to cellulitis so a high clinical index of suspicion is required. Groups at increased risk of necrotising fasciitis include IV drug abusers, alcoholics, those with immunosuppression, chronic disease and haematological malignancies. However, half of cases occur in young and previously healthy individuals. a) Patient complains of severe pain but there is no visible skin change. This is one of the best early diagnostic features. Pain may be severe before any skin changes are seen, & very marked tenderness may be present, despite apparently normal skin appearance, due to the deep nature of the infection. Spread is characteristically rapid and response to antibiotics poor. Systemic toxicity develops, manifested by high fever, hypotension, leucocytosis, delirium, and renal failure. Later, more obvious, signs are visible skin bruising, then necrosis, and gas in the tissues detected on palpation or imaging (eg x-ray). However, any suspicion of necrotising fasciitis requires immediate surgical referral and assessment by an experienced surgeon. The patient will also require intensive care, so early involvement of intensivists is necessary. Severe pain with minimal skin changes is suggestive of necrotising fasciitis. Blood cultures are only indicated in class III or class IV cellulitis. Use mupirocin nasal ointment to eradicate nasal carriage when treating impetigo on the face. Dont forget MRSA as a cause of infection not responding to treatment. CREST. Guidelines on the management of cellulitis in adults. Clinical Resource Efficiency Support Team. 2005. Eron LJ & Lipsky BA. Use of cultures in cellulitis: when, how, and why? Eur J Clin Microbiol Infect Dis 2006; 25:615-617. Stevens DL, Bisno AL, Chambers HF, Everett ED, Dellinger P, Goldstein EJC et al. 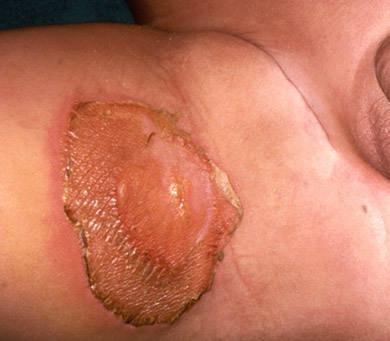 Practice Guidelines for the Diagnosis and Management of Skin and Soft-Tissue Infections. Clin Infect Dis 2005;41:1373-406. Swartz MN. 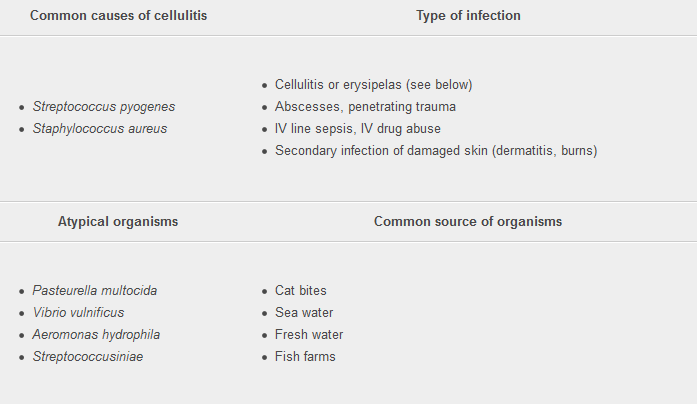 Cellulitis. N Eng J Med 2004;350:904-912. Su YC, Chen HW, Hong YC, Chen CT, Hsiao CT, Chen IC. Laboratory risk indicator for necrotising fasciitis score and the outcomes. ANZ J of Surgery 2008;78:968-972. Useful information and upto the point.